Tamales: Chicken, pork, green chile & cheese (vegetarian), or butternut squash mole (vegan). $28 per dozen. Enchiladas: Chicken verde, chicken mole, butternut squash mole (vegetarian), or cheese verde enchiladas (vegetarian). Just heat and serve. $20 per pan of 10 enchiladas. 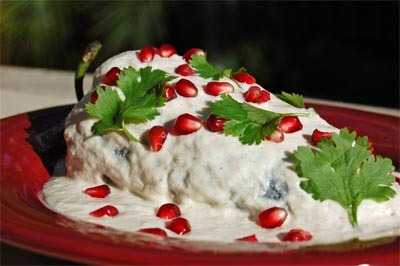 Chiles en Nogada: Roasted chiles stuffed with a mixture of pork, almonds, candied fruit, pickled chiles, and olives topped with walnut cream sauce and pomegranate seeds. Vegetarian chiles made with butternut squash instead of pork also available. $7.50 per chile, minimum of 4 chiles per type. Oaxacan Rice Crispy Treats: Rice crispy treats with the classic Oaxacan flavor combination of orange and anise. $18 per dozen. Place your order online or email us. All our tamales are gluten-free as is our mole. The mole does contain almonds. The butternut squash mole enchiladas can be ordered vegan. ORDER BY: Friday, December 21st. WHEN TO PICK-UP: Sunday, December 23rd. DELIVERY: Monday, December 24th. 10% delivery charge with a minimum $5 delivery charge. Yes, we cater. And we deliver. Click here to view our menu. We have catered parties for 10 to 300 people. Generally, the cost is about $11 to $14 per person. Order via our online catering request form or email us to work on a menu for your event.